‘Vira’ means warrior and ‘bhadra’ means best. Virabhadra was a mighty warrior in an epic poem by the 5th century Indian dramatist Kalidasa. 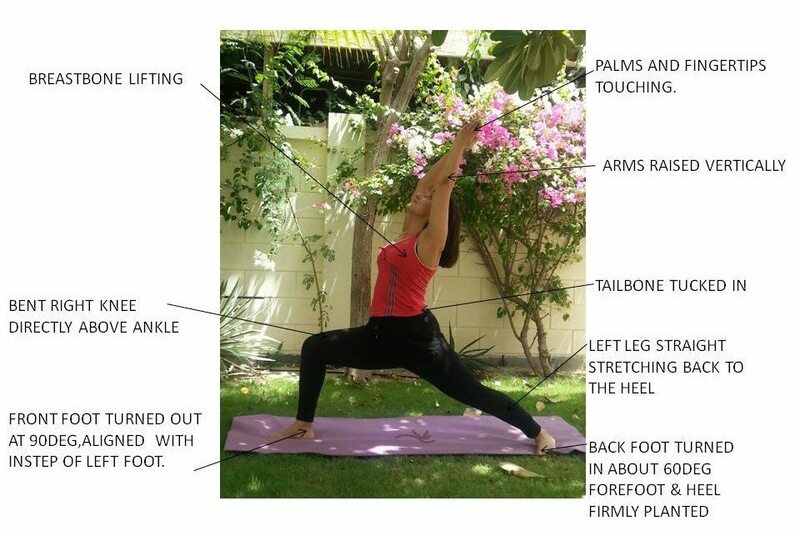 Virabhadrasana 1 is a strengthening pose, a dynamic posture in which you turn your trunk to the side. It stretches the joints between the vertebrae, working on restoring the spine’s natural flexibility. Jump and spread your legs 3 to 4 feet apart and your arms sideways. Stand on a line, toes pointing forward and palms turned down. Turn the palms up. Raise your arms. Keep your elbows straight. Turn your right foot out 90 degrees and your left foot in 45 degrees. Revolve your hips and turn your trunk to the right. Bend your knee to form a right angle. Keep your left leg poker stiff. Look up at your fingertips. 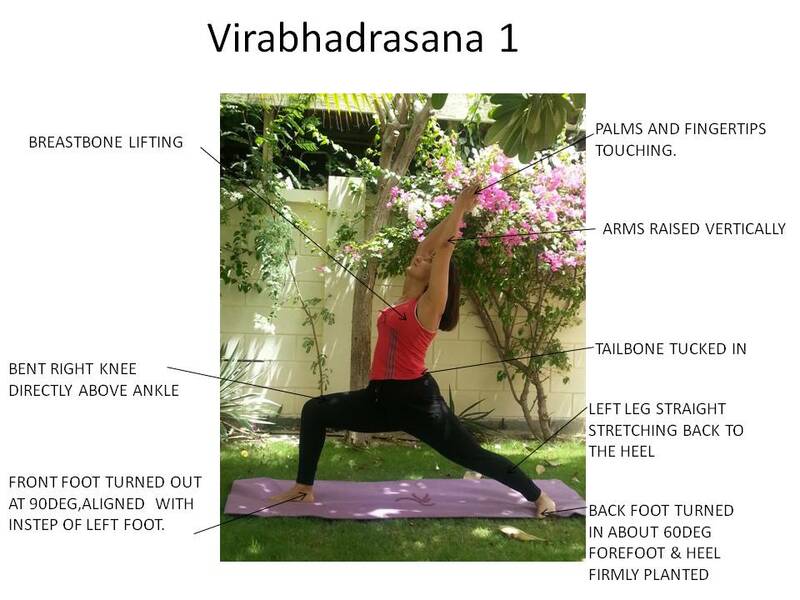 This is Virabhadrasana 1. Be firm and strong like a warrior. Distribute your weight evenly on the key points of both feet. Keep your raised arms straight. Warrior 1 is one of the many poses that encourages you to flex, extend and rotate your arms further than you thought they could go. The arm lift is a powerful movement which involves stretching more than the arms. It begins at the side of the ribs, an action that lifts the ribcage and stretches the armpits, the upper arms, the elbow joints, the forearms and the hands. Thus enjoy this powerful stretch engaging the lower and upper body, as you lengthen and strengthen!